Blushes are one of the most prettiest and appealing makeup products to own! There isn't anything more feminine and appealing than a bright pink blush swept over the apples of the cheeks. With that being said, I thought it was time that I talk about the blushes that I use the most in my collection and some of the more neutral and often overlooked shades that can often transform your look. 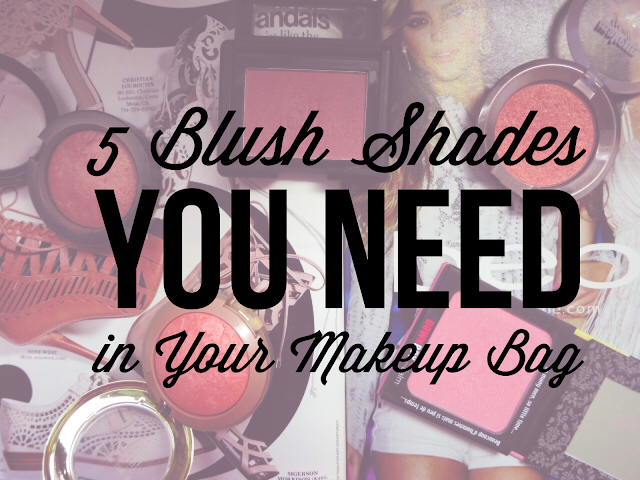 If you'd like to know what 5 blushes I'd take with me to a desert island, keep reading! Over the past year or so, as my blush collection has grown larger than any girl really needs it to be, I've realised that my everyday and go-to blushes are generally quite neutral. I think this is because they look more natural on the cheeks, and you don't really need to think about what you do with the rest of your makeup, they just compliment any makeup look or style. There will always be room in my collection for a bright pink blush, however when you're next shopping for a blush shade, why not try something a little more understated and you may be surprised at how much you use it! Specifically, golden and beige blushes that have slight shimmer in the formula can make your skin look glowing and healthy which is why I love using them! 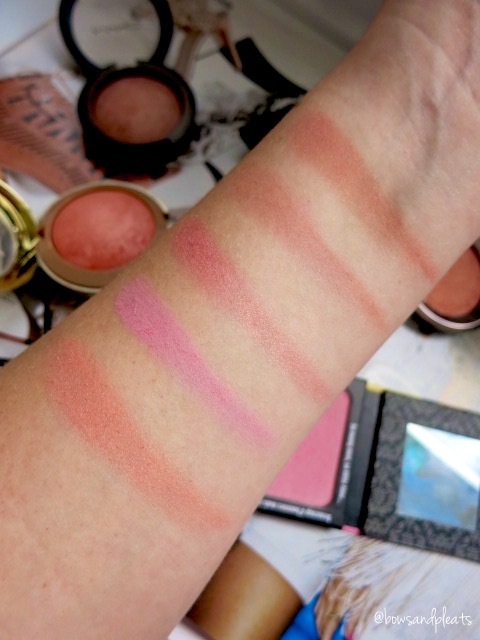 This baby has been my holy grail of blushes for a long time, read more here and here. It is a brown beige shade with golden pearl. It goes with everything. It makes skin look away and adds some warmth to the face. You can't go wrong with this shade. If you don't own any MAC blushes, this one is honestly all you need. I have quite a few and this is my most used shade by far. For the bargain hunters out there, I've got you covered. This is a beautiful neutral shade with a hint of mauve, making it a gorgeous fall or winter choice. The formula is a silky finish so it blends out really nicely into the skin and comes off pretty matte in this swatch. I applied the same amount of pressure for the swatch as the other blushes, and it is slightly less pigmented but can easily be built up as desired, and for that price how could you complain? The Makeup Geek formulation of blushes is spot in, with great pigmentation and blendability. This is my far my most used shade, and one of my all time favourite blushes EVER. 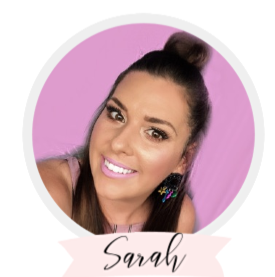 It is a stunning rose gold colour that has quite a bit of metallic shimmer so it has a special way of making your face look really bronzed and beautiful without actually needing a bronzer. I love pairing this with a minimal eye and winged liner but it goes well with everything. The pigmentation of this blush is unreal! Remember when I said everyone loves a perfect pink blush? Well. this is the blush I think of when I want that perfect pink shade! This is a gorgeous cool baby pink that adds just the right amount of colour to the cheeks. This is quite pigmented and can be built up for a more dramatic look. The formula is finely-milled and it comes off fairly matte in the swatch with some light-reflecting particles to keep the skin looking glowy. Known to be a cult favourite among beauty enthusiasts, this blush from Milani can sometimes be difficult to source here in Australia, but you can find it here from Crush Cosmetics. This shade is the most shimmery out of them all, but is by no means chunky or glittery. The peachy shade has a tinge of pink in it and is great for adding a lot of warmth and colour to the cheeks. It lends itself well for application on a hot summer day, while on holiday or when heading off to a music festival. Well, I hope you enjoyed having a close look into my most loved blush shades! It's funny how sometimes the shades you least expect to love, are often the ones you end up using the most! What are your favourite blush products? What other shades do you think I need to add to my collection? Love the look of Warm Soul, Mellow Mauve and Romance ! I have Luminoso and love it, its a beautiful glowy, peachy blush. Oooh I don't have any of these shades! I think I need to pick up warm soul, next I'm near a mac counter!! 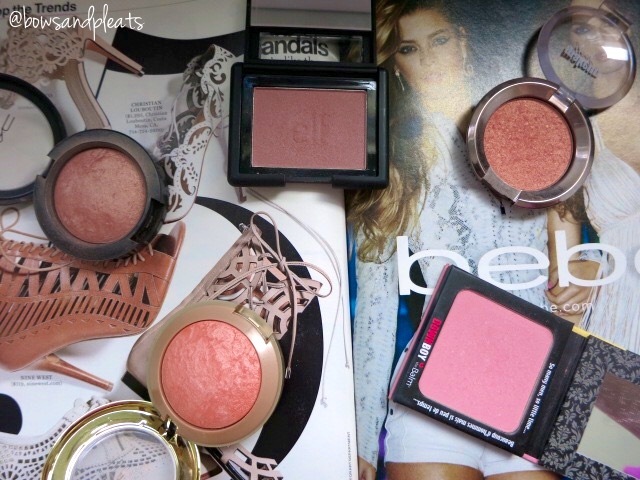 I Luurrrvvveeee that elf blush and the milani baked blushes! They are seriously life! oh wow, these are all such beautiful colors!! thanks for sharing! I think Warm Soul is my holy grail too which is surprising since I'm usually peachy-pink all the way! It just look soooo pretty on the cheeks! I neeed to get my hands on Luminoso - waiting for my US trip next year haha! 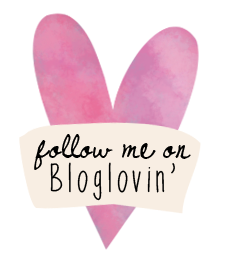 You have a lovely blog, I'm so glad I discovered it! 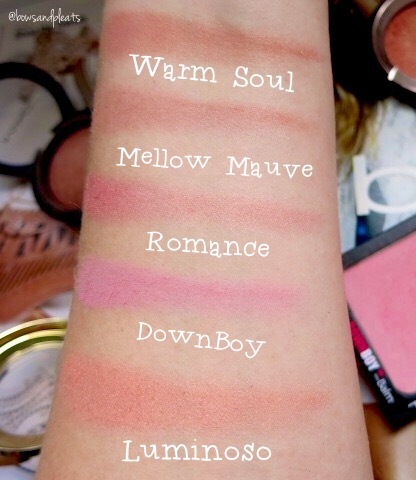 Luminoso and warm soul are two blushes I've been meaning to try for years, there are so many good ones to try! I used to love pink blushes before, but when I tried beige blushes, I love them even more. I guess because they look good on my skin and more natural. I need to try more of the Milani blushes! Do you have any recommendations? I've been trying to get luminso for ages now, it's always sold out. the ones I have are berry a'more and rose d'oro both awesome!